Kia is entering the electric vehicle market in 2014 with an EV version of its Soul mini SUV. AOL Cars is in South Korea to try that car's forerunner, the Ray EV, which is leading the charge for the brand's electric future. We took it for a spin around the heaving city to see what we could learn about the Soul, which will use an enhanced version of its tech. Right, let's get this cleared up from the start – the Ray is not, and will never be, available in the UK. But before you click away, you need to know that this car is pioneering the technology that will appear in the Soul EV that'll arrive in the UK in the winter of 2014. 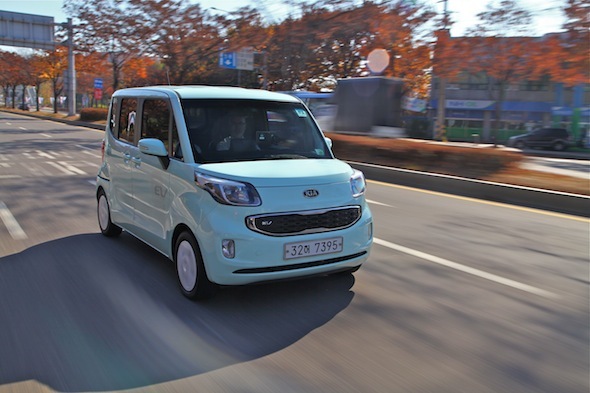 The Ray is a micro city car for the Korean market where some 67,000 have been sold. The EV version, though, is only available on a pilot car sharing scheme in Seoul where 180 of the tiny motors are available to 15,000 members for as little as £3 an hour. Kia has been using the scheme to gain data on its EV models that it has used to refine the mass production Soul version... which will be coming to the UK! Well, what's more important is what's under the seats. Hidden in the floor pan is a battery pack that's coupled to an electric motor situated in the more traditional location under the bonnet. We won't concentrate too much on what the Ray features, as much of this has been enhanced for the Soul. The Soul EV has a range of 125 miles, can be fully charged in five hours or topped up in just 25 minutes with a fast charger. Top speed is 90mph and it will hit 60mph in around 14 seconds. That's unclear at this point, but what we do know is that when the Soul EV arrives it will be the most expensive model in the range. That will mean it's likely to have Kia's top spec too with a clever sat nav system that will point out recharging locations and range, just like our Ray EV test car did. Kia did tell us the Soul will come with heated and cooling front and rear seats and a heated steering wheel. Slightly different bumpers and headlamps, and a charge point in the grille, will mark out the EV version from the rest of the Soul range. There most certainly are. BMW is the latest entrant to this market with the i3, but electric car buyers can also choose from more established offerings from Nissan like the Leaf, or Renault's Zoe. If you're looking for something even more outrageous, then you could consider a Twizy. AOL Cars ran one as a long-term test car for six months and loved it. This car is pioneering the technology that will appear in the Soul EV that’ll arrive in the UK in the winter of 2014. Hidden in the floor pan is a battery pack that’s coupled to an electric motor situated in the more traditional location under the bonnet. The Soul EV will have a range of 125 miles, can be fully charged in five hours or topped up in just 25 minutes with a fast charger. Top speed is 90mph and it will hit 60mph in around 14 seconds. If the Ray EV is anything to go by, the Soul promises a lot. On clogged streets in South Korea’s capital, we found the brisk, smooth acceleration of the battery powered model a boon. The silent running makes for a relaxing drive and the added weight from the batteries was hard to spot. We’re impressed with Kia’s first entry into the EV market – and it helps it comes in the funky Ray body shape. The Kia Soul EV is likely to have Kia’s top spec too with a clever sat nav system that will point out recharging locations and range, just like our Ray EV test car did. If the Ray EV is anything to go by, the Soul promises a lot. On clogged streets in South Korea's capital, we found the brisk, smooth acceleration of the battery powered model a boon. The silent running makes for a relaxing drive and the added weight from the batteries was hard to spot. Regenerative braking was also impressive, if a little aggressive when slamming on the anchors at times. We're impressed with Kia's first entry into the EV market – and it helps it comes in the funky Ray body shape. Even if we won't see it on UK shores, the Ray points to impressive things to come from the Soul EV. There's currently no word on pricing for the Soul or whether buyers will be offered the car complete with batteries to buy outright, like Nissan, or rented the batteries and sold the car, like Renault. What was clear from our test drive, though, is that Kia has EV technology pretty much nailed and it's ready to go. Factor in the likelihood that the manufacturer's competitive pricing will be brought into the equation and the Soul EV could be the shake up the segment needs.